From Goodreads: Bonnie and Clyde meets Simone Elkeles in this addictively heart-wrenching story of two desperate teenagers on the run from their pasts. They’re young. They’re in love. They’re on the run. Zoe wants to save Will as much as Will wants to save Zoe. When Will turns eighteen, they decide to run away together. But they never expected their escape to be so fraught with danger…. When the whole world is after you, sometimes it seems like you can’t run fast enough. Nobody But Us, told in alternating perspectives from Will and Zoe, is an unflinching novel, in turns heartbreaking and hopeful, about survival, choices, and love…and how having love doesn’t always mean that you get a happy ending. I’ll admit, when I saw mention of Bonnie and Clyde on the ARC cover, I was skeptical. This is YA and Bonnie and Clyde were legitimate criminals. How much trouble can Will and Zoe possibly get into? Uh, a lot, it turns out. 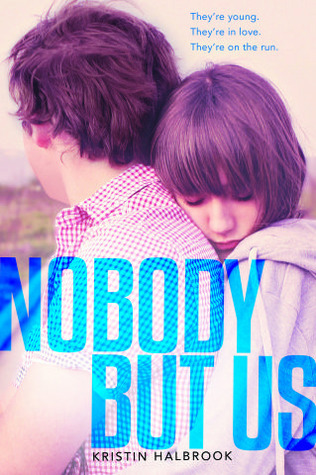 Nobody But Us is intense, and Kristin Halbrook holds nothing back. Will’s backstory is one of the saddest I’ve read, and poor Zoe doesn’t know love until she meets this boy who wants nothing more in the world than to rescue her. They literally are on the run–from her father, from their pasts, and from the law–and they make some pretty terrible choices along the way. The crazy thing is this: I was rooting for them. Even in the midst of a multiple-state crime spree, I wanted Will and Zoe to persevere. Kristin Halbrook, through flawless character development and stark, elegant prose, made me believe that Zoe and Will deserved a happily ever after. Nobody But Us is a roller coaster of emotions. Zoe and Will are both adorable, and both so very broken. But together they are whole, taking on the world that’s wronged them. Their devotion, while young and sometimes misguided, is palpable. They love each other deeply, sweetly, tragically, and the ferocity of their relationship had me at times laughing, cringing, and nearly in tears. I was both charmed and appalled by the sacrifices they were willing to make for each other, and even when they did horrible, deplorable things in the name of love, I got it, because their motivations were so strong, and their bond so unbreakable. I’ll say one more thing about Nobody But Us: The ending… shocked me. It was courageous and heart-wrenching and unlike most YA endings. Yet, it was perfect for the tone of the novel. I’m STILL thinking about it. Head to Goodreads now and add Nobody But Us to your To-Read shelf, and please pick this book up when it’s available early next year. I think you’ll love it! What’s the best contemporary you’ve read lately? This sounds so fabulous, and I can’t wait to read it. Go Kristin! It really is fantastic, Rebecca… I bet you’ll love it! You sold me! Can’t wait for this one now!! Funnily enough, the whole time I was reading NOBODY BUT US, you and your writing were in the back of my mind. I saw many similarities in the emotional punch and the unflinching, intensely flawed relationships in this book, and the stories I’ve read of yours. I think you’ll love this one, Heather! Why can’t this be out right now? I want to read it so badly! Mark it To-Read now so you don’t forget about it come January. It’s so, so good, Liz! Oh, I love ARCs. It’s so much fun to be one of the ones to read something first. Glad it was good! Isn’t it?! It’s fun to be in on this amazing secret that everyone else has to wait to discover. But, I’m glad you all don’t have to wait *too* long, because NOBODY BUT US is just so good. I’m so excited for others to read it! Definitely adding! And I agree with Liz – why can’t this be out RIGHT NOW?! I bet you’ll love it, Alison… So freaking good! PERFECT CHEMISTRY is awesome. In fact, NOBODY BUT US reminds me a bit of it in its intense realism. Definitely one to add to your To-Read list! I’ve had this one on my list for a while. I mean, BONNIE AND FRICKIN’ CLYDE. But honestly, I’m kind of a sucker for road trip storie told in alternating perspectives. I have no idea why. You’ve made me want to read this that much more. Hurry, hurry, January! I bet you’ll love this, Tracey. On top of the alternating perspective road trip, it’s just PACKED with emotion and and romance. Adored it!